The United States Department of Energy (DOE) initiated new regulations, in January, regarding air conditioning. Manufacturers rate this type of equipment and others, such as heat pumps, on their efficiency using what's known as SEER ratings, Seasonal-Energy-Efficiency-Ratio. For several years, the minimum efficiency standard has been 10 SEER. On Jan. 23,2006, the law changed to require 13 SEER equipment impacting the heating, ventilation and air conditioning market across the country. The new standard requires manufacturers to cease production of A/C components rated less than 13 SEER. While no one can predict how long existing systems may remain in use, manufacturers are now prohibited by law to build A/C components rated less than 13 SEER. The law will ultimately result in a phase-out of less efficient machines altogether. One result of 13 SEER is the increased size of the new units. They are almost twice as large as 10 SEER units are. They take up more space in warehouses and delivery trucks, and may require more than one person to carry and install. That means additional work hours and more cost to both contractors and, ultimately, consumers. Homeowners will face another very real problem when the industry depletes the existing supply of less efficient components now that building them is illegal. An A/C system includes two units that work together: one outside and one inside. If the outside unit of a less efficient system breaks down and there are no compatible parts left to repair it, there may be no other option than to upgrade the entire unit to 13 SEER, at considerable expense. Since the indoor unit must be compatible with the one outdoors to meet manufacturer efficiency guidelines, it will also require additional work. It is understandable, that homeowners will be frustrated when they face a possible system upgrade instead of the standard repair they were expecting. Another issue is the Home Warranties many homeowners have in effect, as the warranty may not address 13 SEER mandated upgrades. So, check with your warranty company. It is probably a good idea to talk with your homeowner insurance company also. American Home Shield, one of the country’s largest home warranty companys, is offering an upgrade to get 13 SEER coverage now for just $30. The AHS resource center can be reached at 800-735-4663 and online at www.13SEERsolutions.com. To learn more about 13 SEER efficiency guidelines, check out http://www.energy.gov/. You can read the actual 13 SEER legislation and find out about the history of the new mandates. Contact the U.S. Department of Energy for more legislative information and questions by mail at 1000 Independence Avenue, SW, Washington, DC 20585 or by phone at 800-DIAL-DOE. Good luck and give us a call, 866-222-0158 #550, if we can help in anyway! This is the headline from Hampton Roads leading newspaper, the Virginian Pilot. 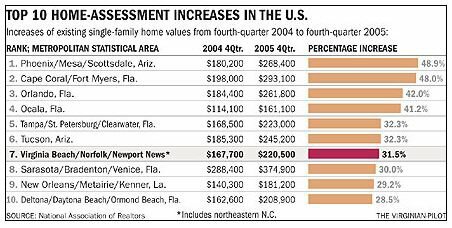 According to statistics from the National Association of Realtors, Hampton Roads ranked 7 out of 145 markets surveyed, in terms of median price increases for existing single-family homes in 2005. This ranking reflects a 31.5% increase over 2004 and a median price of $220,500. This compares to a national increase of 13.6%. Hampton Roads, as well as the rest of the nation, experienced a slowdown in the market during the last few months of last year, but the "bubble is far from bursting". 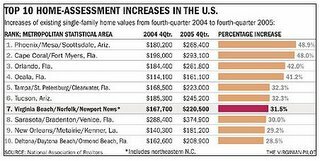 The rise in prices in Hampton Roads is a result of supply and demand. There have been far more buyers in the market than homes available to purchase, resulting in frequent bidding wars with 8 to 10 contracts on a home in a matter of hours. A strong sellers market like this is very frustrating to buyers and pushed many families into renting after losing house after house to higher bidders. The current slow down is a healthy move towards a more balanced market and a cyclical correction that was long overdue. All predications for 2006, call for a slow down in appreciation not a downturn in the market. This year those families who were forced into rentals will be able to enter the market again with a chance at ownership. And that is a good thing! 2006 is a great year to buy or sell a home. Supply is up which is good for buyers. Appreciation will most likely be less than the last couple of years, but, we should still see healthy increases, which is good for sellers. Give us a call, 866-222-0158 #550. We'd like to help you take advantage of today's market! When's the last time someone told you it's okay to screw things up? Well, unless you're a neurosurgeon or a ballot counter, it's okay! For most of us, a mistake is an action that can be corrected - it's not usually the end of the world, although we're sometimes made to feel that way. Everyone makes mistakes, so don't let somebody else tell you that your mistakes are any worse than theirs. Of course, we all prefer to succeed rather than to fail. Just remember that most successes actually are the result of at least one failure, if not dozens. Just imagine the realm of scientific discovery - almost every step forward in the name of science really came from taking a lot of steps back! Although trying does not always mean you'll succeed, you'll obviously never succeed without at least trying. Our mistakes are at least a sign of effort (and of room for improvement!). We just have to keep going until we get it right - study harder, pay more attention to details, listen more carefully. There is honor in persistence - you can't be faulted unless you just give up. We're taught from an early age that mistakes are acceptable as long as you learn from them. By focusing only on successfully reaching our destination, we tend to overlook the journey and all we can learn (and teach) along the way. Every mistake is an opportunity from which either we or our peers can learn something. In "Leadership Secrets of Attila the Hun," author Wess Roberts illustrates that "every hun is useful, if only to serve as a bad example." We all know the adage about "nothing ventured, nothing gained." If we do nothing, then we teach nothing, learn nothing, and gain nothing. If we are afraid of failure, then we are ultimately doomed to experience it. Embrace life's challenges, do the best that you can do, and be willing to accept the consequences! Make mistakes, but at least make something! We can't promise there won't be bumps along the road in a real estate transaction, but we can promise to use our 20 years of experience to smooth them out. We will take care of all the details, so, you can take care of yourself and your family. Give us a call, 866-222-0158 #550. We'd like to take care of your next real estate transaction. The Breast Cancer site is having trouble getting enough people to click on their site daily to meet their quota of donating at least one free mammogram a day to an underprivileged woman. It takes less than a minute to go to their site and click on "donating a mammogram" for free (pink window in the middle). This doesn't cost you a thing. And, you can do it every day. Their corporate sponsors/advertisers use the number of daily visits to donate mammograms in exchange for advertising. Here's the web site! Pass it along to people you know...it could save someone's life!! And, please tell 10 friends to tell 10 friends, today! Also, thinking about buying or selling a home? Call The Butler Team 866-222-0158 #550 or visit our website. We'll take care of you just like family!